Home » Audio » Paul Rutherford, Ken Vandermark, Torsten Müller & Dylan van der Schyff: Are We In Diego? 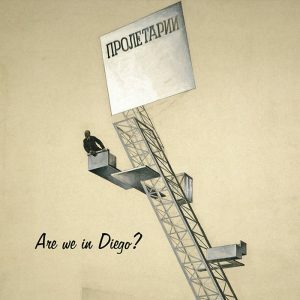 Paul Rutherford, Ken Vandermark, Torsten Müller & Dylan van der Schyff: Are We In Diego? This recording features the late trombonist, Paul Rutherford, in an outstanding performance from 2004. The band was concluding a West Coast tour and shows both fire and sensitivity, delivering two extended improvisations and four well-focussed miniatures. With Ken Vandermark (reeds), Torsten Müller (contrabass), & Dylan van der Schyff (drums, percussion). Cover art: El Lissitzky, Lenin Tribune, 1920. State Tretyakov Gallery, Moscow [Public domain].